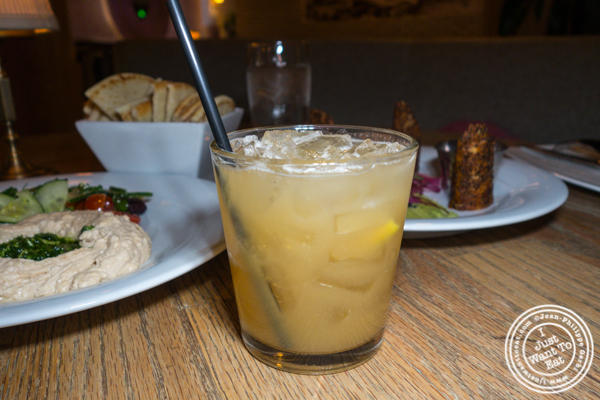 I started with a cocktail, 14th on Main, that was made with Buffalo Trace Bourbon, maple syrup, grapefruit juice and lemon juice. Well balanced and citrusy, it was quite good. 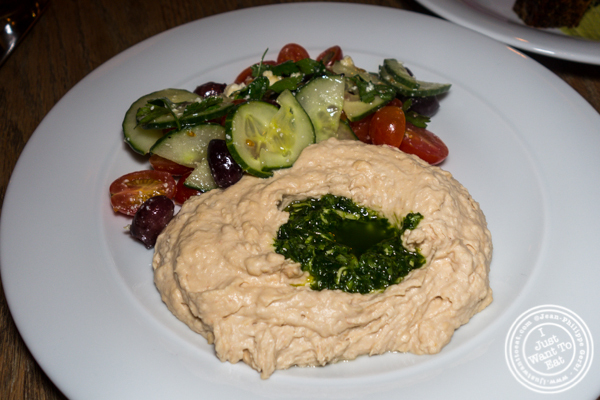 Then we shared the white bean hummus that was served with pita, arugula pesto, cucumber and tomato salad, and feta. This was quite good, but a bit filling. 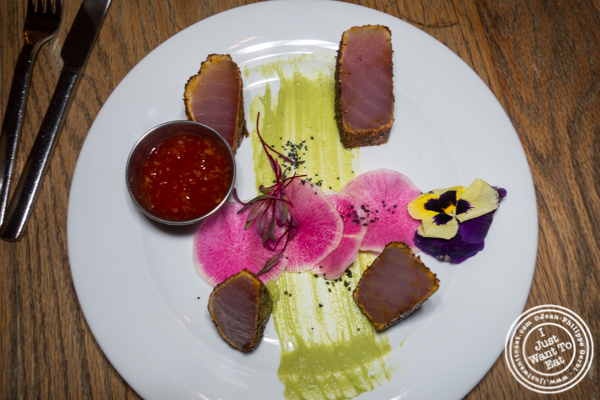 Especially with the ahi Crudo that was four pieces of ahi tuna that was dusted with spices, accompanied by a yuzu avocado purée and watermelon radish. I liked it but would have probably preferred thin pieces of tuna and more avocado purée. As there were no vegetarian entrees, Jodi ordered the mushrooms that were prepared with garlic, thyme, shallots and Parmesan; as well as some roasted cauliflower and faro. While I had the Diver scallops and shredded pork belly, a sort of surf and turf. It came with truffled sweet corn nage and roasted corn, as well as oyster mushrooms. This was delicious and everything worked perfectly together. The scallops were perfectly cooked and I loved the sweetness that the corn added. Dessert was however just ok: it was a cinnamon bread French toast that I found a bit dry. Overall it was good. Not sure I would put Delphine as a must have though...No, not at all. I should mention that they add 17% tip automatically and the waiter told us that this was what the hotel was doing and that any additional tip would be for him...17% is already a decent tip, no?